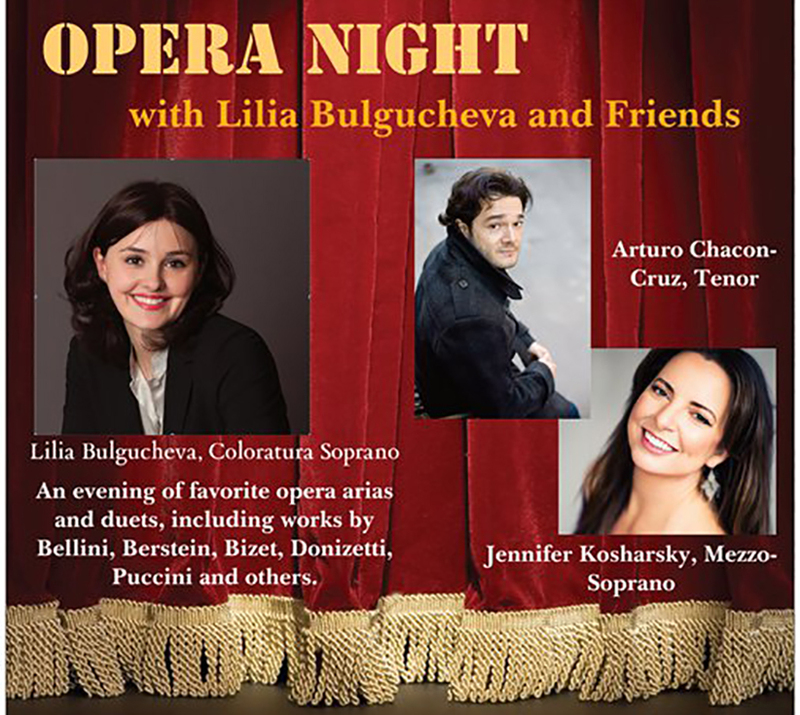 A portion of the proceeds will benefit Meals on Wheels Diablo Region. Learn more here. 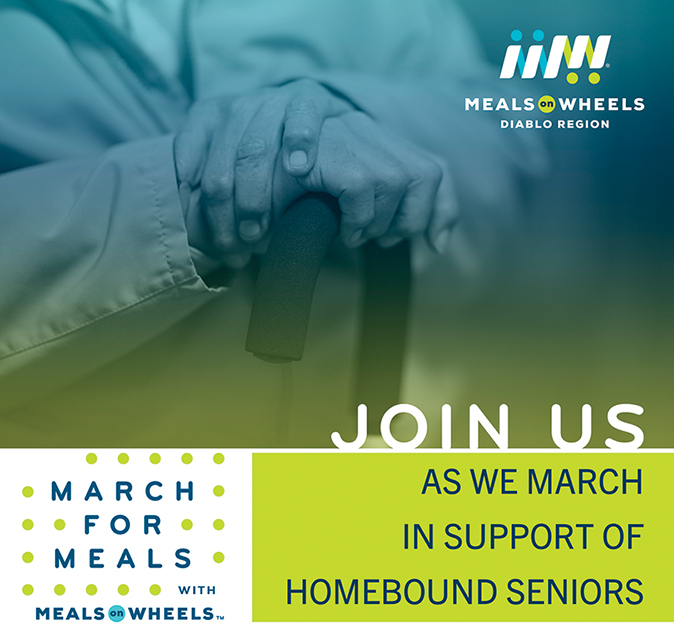 For the 17th year, Meals on Wheels agencies across the country will take part in the March for Meals campaigns aimed at bringing attention to the needs of seniors. The national March for Meals campaign is an annual month-long event designed to generate public awareness about senior hunger and isolation and to celebrate the invaluable services provided by senior nutrition programs. Given the exemplary public-private partnership Meals on Wheels embodies, this annual campaign is also intended to showcase the successes of the Older Americans Act, help recruit new volunteers from our community, and increase fundraising from local businesses and supporters. In celebration of this important campaign, Meals on Wheels Diablo Region is hosting two events—Community Champions Week and March for Meals Community March. Each year Meals on Wheels Diablo Region rotates cities and holds a peaceful advocacy march to increase awareness of issues faced by seniors in our community. This year our march will be in downtown Brentwood around City Park on Friday, March 15th, from 11am to 12:30pm. This is an intergenerational event open to anyone interested in advocating for those who may not be able to speak on their own behalf. Attendees create their own signs and after marching enjoy the lunches they bring while listening to presentations from local elected officials. This event will support our efforts to raise awareness, unite intergenerational walkers in a positive way, teach local students about advocacy and giving back to their community, and drive our mission to improve the lives of seniors. To participate in this year’s March for Meals Community march please contact Susannah Meyer, Community Engagement Director at smeyer@mowdr.org or call 925.239.2487. Click here to download a flyer. Community Champions Week will be celebrated between Monday, March 18 and Friday, March 22. During this time, Meals on Wheels Diablo Region invites city, state, and federal officials, and other respected community leaders, to join our volunteers and help deliver meals to seniors. Ride along opportunities are available at sites throughout most of the county and typically occur between 10:00 AM and noon and vary by city. Dignitaries in Contra Costa County are in an excellent position to help raise awareness for the growing number of seniors facing hunger and isolation, both serious problems currently impacting our community and our nation at large. To participate in a Community Champions ride along please contact Susannah Meyer, Community Engagement Director at smeyer@mowdr.org or call 925.239.2487. Thank you all of our donors and sponsors who made this event a success and to all of our amazing volunteers for attending this year's event - we look forward to seeing you next year! Thank you to everyone who helped make this a successful event! 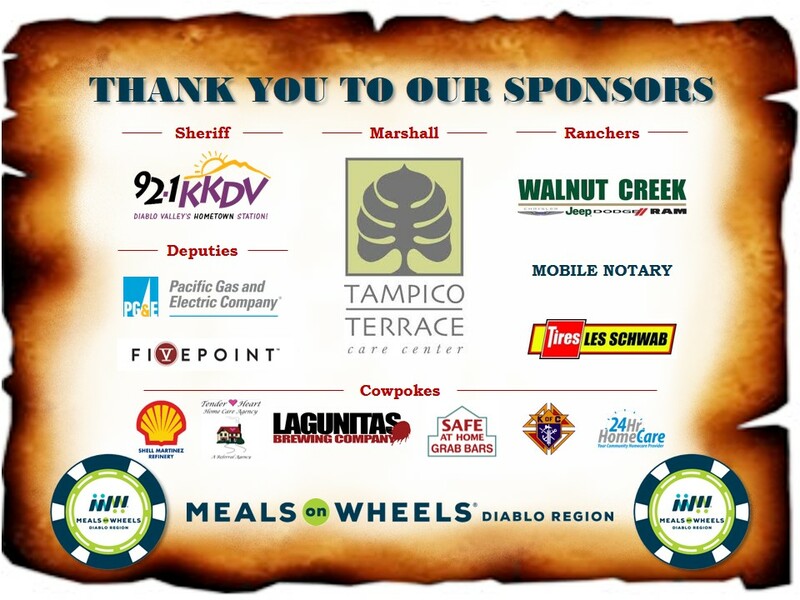 Click here to see our awesome sponsors! IN OUR 50th ANNIVERSARY GALA CELEBRATION! Click here to view our wonderful Gala sponsors! Click here to view our wonderful Gala donors! THANKS TO SUBARU AMERICA FOR SHARING THE LOVE WITH HOMEBOUND SENIORS! Through the 2017 Share the Love Event, from November 16, 2017, to January 2, 2018, Subaru donated $250 for every new Subaru vehicle purchased or leased to the customer's choice of the four national charities, including Meals on Wheels America, with a minimum guarantee of $250,000. 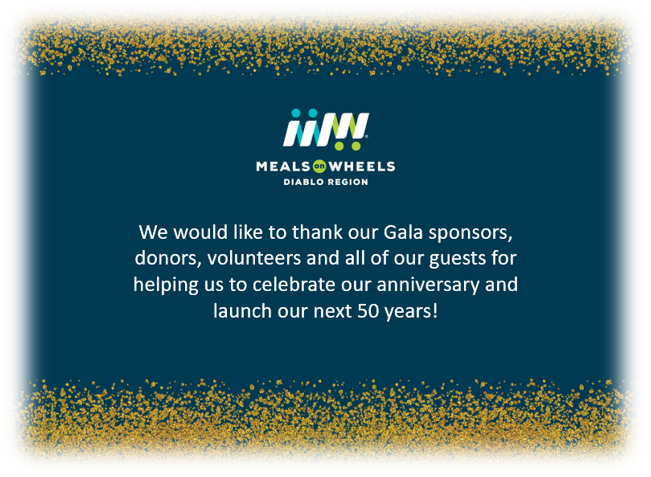 If you have questions regarding any Meals on Wheels Diablo Region event, contact Susannah Meyer, Community Engagement Director, at 925.239.2487 or smeyer@mowdr.org.